More of the same today in Nice. Clear skies, cold temps in the morning leading to Northerly drainage winds for the first race, then a long pause while the wind switched to the Southwest. The wind never filled very strong from the SW today so there was only one race held in the afternoon. In the morning race, we had TeamOrigin as our opponent. Artemis helmsman, Terry Hutchinson, did and excellent job against TeamOrigin Helmsman Ben Ainslie and won the start convincingly. We were ahead from that point on and the afterguard did a nice job of protecting and extending our lead. We were never threatened and went on to win the race by 45 seconds. In the other match of the morning, Team New Zealand beat BMW Oracle. Once the wind shifted to the southwest, one flight was held. In the first match, Synergy did a nice job to win the start over French Spirit leading from the start. In the second match, All4One had the early lead off the line but was on the left side of the course leaving Azzurra to the right. At the first cross Azzurra had the lead. Azzurra then let All4One get to the right of them where they promptly took over the lead and led comfortably around the windward mark. Down the run, All4One forgot how good the right was and gybed away from that side letting Azzurra have it and Azzurra promptly passed All4One. At this point, Azzurra recognized that the right was better and kept it going on to win that match. We got in our boat and prepared for the third flight of the day which would have featured Artemis against BMW Oracle and Team New Zealand against TeamOrigin. However, it was decided that the wind was too weak at 5-6 knots, so we never raced. Those two matches will be first up tomorrow. Following that, there is just one match to be held and then Round Robin one will be completed. We start Round Robin 2 on Saturday. Tomorrow night there will be the Louis Vuitton party. They are always special. 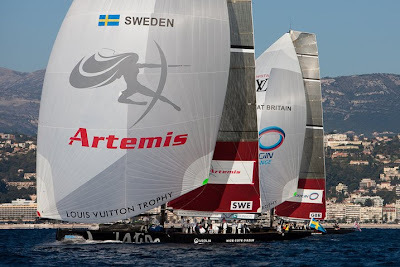 For complete results and even live streaming of the races go to http://www.louisvuittontrophy.com/and the team's site http://www.artemisracing.com/.